I came across it on eBay, and the description was pretty vague. (Which is why I never posted it on my site; I didn't feel I had enough information about it.) 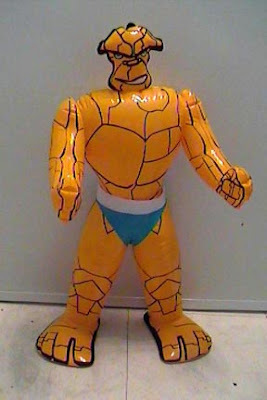 He only said it was 24 inches tall when inflated and had a 2000 copyright date. I never heard or saw anything about it this ever again. I suspect it may have been used as a carnival prize or something like that. Maybe? Anyway, I just found it buried on an old CD and thought I'd share because... well, the internet was made for weird crap like this, wasn't it?